Ajax Tools Exec. V.P. of Operations, Mike Malget, with MIDACO’s AS5020SD Automatic Pallet Changer “still performing like new” since 2002 on their Daewoo DMV650S (left) and New MIDACO A5025SD on their Doosan Mynx 6500 (right). MIDACO Automatic Pallet Changers provide quality, value and longevity. Sixteen years ago Ajax Tool Works in Franklin Park, Illinois needed a solution to increase production on their Daewoo DMV 650S. Being a full service manufacturer of industrial tools since 1946, they are focused on their own customer’s needs and have earned a reputation of uncompromising dedication to quality. Choosing a MIDACO A5025SD Automatic Pallet Changer to add on to their VMC fit right in with their commitment to their customers. The proof is shown in the longevity of their pallet changer purchased in 2002 and their choice to contact MIDACO their second Automatic Pallet Changer System. Ajax has machining capability from large production runs to small specialized jobs on their CNC machines. They have had consistent and reliable performance from their MIDACO unit over the past 16 years with heavy duty usage. Mike Malget, Ajax Tools Executive V.P. of Operations, shared why they recently decided to equip their Doosan Mynx 6500 with another MIDACO Automatic Pallet Changer. Ajax Tool Works serves major markets in the construction and industrial trade, foundries, railroads, utility and telephone industries with a second-to-none service reputation. They depend on their machinery to perform well so that they can meet the demands of their customers. 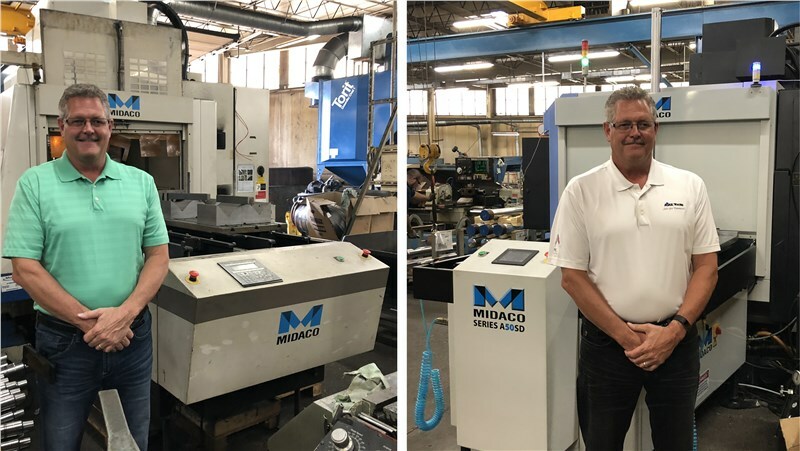 With Automatic Pallet Changers exchanging pallets in seconds significantly decreasing their VMC spindle idle time, and with +/-.0001” (.0025mm) repeatability, MIDACO has been a reliable asset for Ajax to meet those demands, and will continue to be a stable presence in their shop for the long term.